In order to thrive in today’s rapidly changing philanthropic landscape, nonprofit organizations must develop smart and engaging fundraising strategies that leverage new and emerging forms of giving. 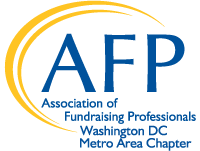 AFP DC exists to give fundraisers the knowledge, tools, and community they need to put these strategies into practice and advance their organization’s missions. We share industry-wide best practices, hands-on tools and techniques from philanthropists and experts and a robust calendar of educational events, webinars, and our Bridge to Integrated Fundraising & Marketing Conference. We provide accreditation training for the Certified Fund Raising Executive (CFRE) credential. The Bridge Conference is attended by more than 2,200 fundraisers, C-Suite executives, and philanthropists each year. Nearly 400 individuals attend our education and certification trainings annually. We currently have more than 100 CFRE and ACFRE professionals among our members. Click a heading for details. The Advanced Executives program is geared toward fundraisers with 10 or more years in the profession and is perfect for "decision makers" in an organization including CEOs, Chief Development Officers, and others with responsibility for Planned Giving, Capital Campaigns, Major Gifts, Annual Giving, Foundation/Corporate Relations, consultants and board chairs. The Fall CFRE study group is a seven-week study group hosted annually by the AFP DC Chapter. Sessions include subject areas from the CFRE test content outline and resource materials provided by CFRE. Once you are registered, you will be sent the syllabus, complete with the schedule of planned readings and speaker information, so that you can come prepared for the first session. Core Education Sessions include a mix of tactical and strategic sessions suitable for a range of experience levels and organization types, with built-in networking time. In the battle over getting credit for gifts, we are losing valuable time, money and morale. Are your development operations set up for success? Are major gifts and direct mail fighting over donors or who gets credit? Is the program team at war with development? How do you get everyone to play nice in the sandbox? Let Rachel Muir and Mark Rovner sort this all-too-common situation out and show you how to make it work! You will come away with pearls of wisdom and helpful tips to promote a culture of philanthropy and create cohesion your organization. FREE for AFP DC Chapter members! Earn CFRE credit. Changing the world may not be impossible, but some days it feels like it. Challenges are vast: limited resources, increased competition, elevated donor expectations, high staff turnover, and an expectation for an annualized ROI–and that’s just to name a few. When it comes to driving change and innovation within an organization, one concept that has been transformative for both Pursuant and our clients is Breakthrough Fundraising. We’ve seen this framework transform the culture within organizations and help development teams shatter their goals. In this webinar, Pursuant’s Kelley Stewart explains how Breakthrough Fundraising can help you produce powerful results for your organization. Embracing and applying this practice won’t be easy – nothing worth doing ever is. But we’ve seen how the practice of Breakthrough can revolutionize an organization for the better and we believe your mission is worth it. Through varied programs like our annual Diversity Dialogues and the establishment of the African-American Affinity Group, our chapter has repeatedly shown that we value, embrace and benefit from diversity. In fact, Diversity and Inclusion are so important to the AFP DC chapter, that each year the Board of Directors reviews and includes an annual strategic plan and passes a formal resolution on the topic. The IDEA Committee of AFP DC presents the annual Diversity Dialogues events to ask and answer critical questions and to provoke discussion about diversity & inclusion in fundraising. Diversity Dialogues-How Can Development Professionals Engage a More Diverse Staff, Donors and Board? Fundraising Brown Bag sessions provide an opportunity for fundraising professionals (or not-yet professionals) to come together in a less structured free-flowing environment to share their lunch time and discuss topics that are relevant to them. All fundraising professionals are invited, such as individuals early in their professional fundraising career, individuals who may not yet belong to a professional fundraising organization or individuals who have never attended fee–based educational program. Other individuals may be seasoned fundraisers that are interested in the topic or who want to spend time with up-and-coming fundraisers. As philanthropy consistently evolves, so too must our approach to fundraising. AFP DC helps our members respond to the latest trends in philanthropy, leverage new technological advancements and target new and emerging donors markets. We offer cutting-edge and innovative educational programs that will challenge, inspire and improve members’ careers. AFP DC webinars are FREE for members. The cost for non-members is $30. AFP DC offers three webinars per year. Below are the last two this year.